The decision of U.S. District Court Judge Neil V. Wake to overturn a 1988 Flagstaff, Arizona ordinance prohibiting begging in public is going to have wide-ranging ramifications. Judge Wake also prohibited Flagstaff officials from “interfering with, targeting, citing, arresting, or prosecuting any person on the basis of their act(s) of peaceful begging in public areas.” His rationale was that the Arizona anti-panhandling law criminalized free expression. Free speech may be the underlying issue that makes the Arizona case and others regarding panhandling so important. In Dallas, six people who protested at the George W. Bush Presidential Center at Southern Methodist University have filed suit against a city ordinance banning protest signs within 75 feet of a highway. Some of the protesters were arrested not for their signs, but for solicitation or panhandling. 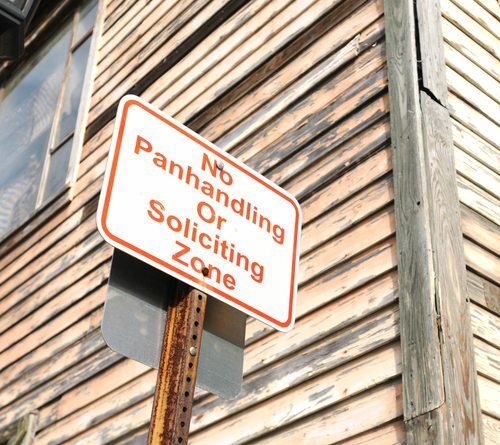 What constitutes panhandling or solicitation? What constitutes a “sign”? What is protected free speech? These and other questions are all embedded in the anti-panhandling bans that many cities have adopted in response to local business interests who are unhappy with the physical presence of homeless people near their establishments. Nonetheless, an increasing number of cities are following Flagstaff rather than the U.S. District Court. In Portland, Maine, panhandling, or even “loitering,” on traffic medians has been banned. (Lewiston, Maine has a similar ban.) The Portland law sounds something like the Dallas anti-protest ordinance, so it should be no surprise that the Portland law has been challenged in U.S. District Court by three plaintiffs: a woman who panhandles, and two men who participate in political demonstrations, alleging that the law compromises free speech rights. The Portland plaintiffs are being helped by the ACLU. Remember that panhandlers will often hold a sign announcing that they are homeless or hungry, thus the linking of the lawsuits against panhandling to political free speech. Worcester, Massachusetts bans people from holding signs asking for help during specified hours of the day and in specific locations. As a result, the ACLU is suing there, claiming that the law violates both “the right to solicit donations peacefully in public and engage in political speech.” While politicians (and potentially local business interests) seem committed to enacting more of these laws, it appears that police aren’t particularly enthusiastic about ticketing and fining homeless people for asking for food and support, as evidenced by the tepid police enforcement of anti-panhandling laws in Anchorage, Alaska and Spokane, Washington. In Boise, Idaho, where the city council was considering an anti-panhandling vote last month, one member of the council announced and explained her opposition: “When we have rights bumping up against each other, we need to balance them,” Lauren McLean said in her statement. “It’s important to me when I vote on issues requiring this balance that I make sure that the rights of the less fortunate aren’t sacrificed for the rights of others.” That neatly summarizes the issues at hand in cities’ consideration of anti-panhandling ordinances. While both glitter in the sunlight, an assayer can easily separate fool’s gold from the real. Distinguishing genuine grassroots organizations from political front groups is not so easy. Whether this is a real concern for the larger nonprofit community is, however, a question.